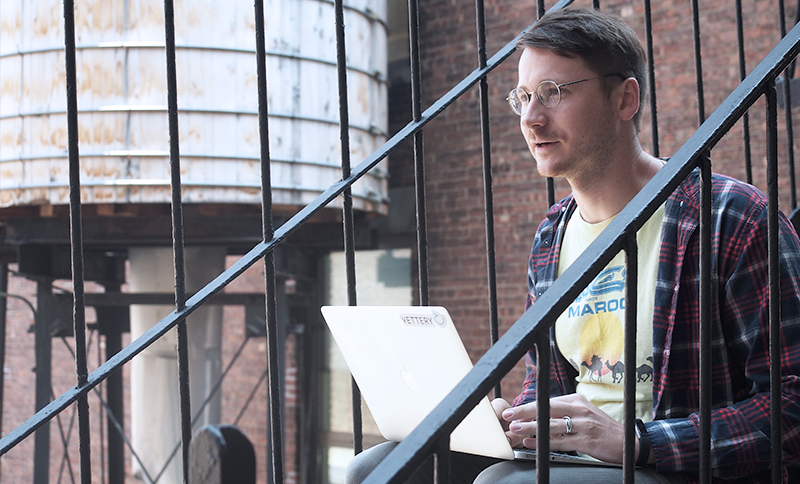 With a background in teaching math and a passion for connecting with people, Mike is one of our Talent Executives at Vettery. Talent Executives are your guide, support-system, and ally as you go through the job search with Vettery. Throughout the process, you’ll be able to lean on your Talent Executive as much as or as little as you’d like. Our Talent team has great insight on the industry, as well as tips for interviewing and landing jobs that you’re truly excited about! We sat down with Mike, one of the Talent Executives, to learn more about his switch from teaching to joining Vettery. Plus, his advice on how to find a job you’ll love. So you were a teacher before you came to Vettery, what did you teach? I taught in inner city schools for four years. High school and 8th grade math, so algebra 1, algebra 2, geometry, and pre-calc. One of the schools I taught at was in Brownsville in East New York. Wow, that’s a lot of time invested in the classroom. Why did you decide to switch jobs and start working at Vettery? When I interviewed at Vettery, I saw how electric and exciting it was to be in the office. Everyone works hard and wants to be there. Between that and realizing that there was a way I could leverage all of the people skills and communications skills I’d built teaching - I was hooked. Communication skills are key. What are some of the other main symmetries between teaching and being a Talent Executive? Great question. I think both of them are, well, both of them are interesting ways to share your personalities with people. People won’t respect you as a teacher if you don’t show them that you’re a human, too. I like connecting with people and sharing in conversations. It’s the idea of being a person and putting that out there. I think there are also symmetries in both because you get to help people achieve a goal, right? Whether that’s a goal they set for themselves in terms of education and their stepping stones to college, or whether it’s helping them find a career that they are really going to be excited about. I like connecting with people and sharing in conversations. It’s the idea of being a person and putting that out there. It seems like you’re invested in the process of helping people find a good life path. How do Talent Executives do that? Or what would you say is the role of the Talent Executive? I think the biggest reaction I get when I begin explaining my role to people is that, “Oh you’re a headhunter.” The reality is that I’m providing a similar service, but without the strings. It’s like all the support but with a different motivation. I think we do a great job of helping people see more opportunities than they would have seen otherwise. I also think we do a really good job in terms of the return on someone’s investment for their time, you know what I mean? It doesn’t take very long to get set up with us. We’re there to help out and take as much off a person’s plate as we can. We want to help show them opportunities that they’re really, genuinely excited about. Okay, so personality and being able to relate to people has been really important in both of your career paths so far. What are a few fun facts people don’t know about you? I love baking. I don’t do it enough, but I actually do love baking bread. For a second I thought I could make everything I really like to do start with a ‘B’. I like bicycling, baking, books and music…But I can’t find a way to make music start with a ‘B’. I really like rap music and listening to the lyrics of songs. I was originally a philosophy and literature major in college which might have helped grow my affinity for words. Maybe that’s what draws me to poetry and lyrics and rap music. That’s great - I can just picture you listening to rap music at work when you’re not on the phone with people looking for jobs! Speaking of which, what’s the environment like at Vettery? What’s your favorite part about working there? I love working here. I love the people that we work with. I love the candidates we work with. I just feel like it’s really nice to be in a place where there’s so many smart, motivated people who are on the same page. I have a lot of faith in the leadership and a lot of faith in the people who are on my team and the other teams that I see around me. So I feel very good about it. So now that you’ve worked at helping people find jobs for a while, what advice do you have for people looking for a job? I feel like when I talk to a lot of people they don’t really know what’s the most important thing to them. Like, some people know salary is important to them and they won’t accept below a certain number or some might say “I really want to work with machine learning” or “I want to join a team where I can manage people”. When you’re looking for a new job, you should definitely take some time to think about what is most important to you. The other thing I would say is that it’s also good to recognize when something isn’t the right fit. And it’s hard, when people are interested in you, it’s really hard to say no to them even if you’re not in love with the company or role. But you have to say ‘no’ when it’s not right for you or else both you and the company will be unhappy in the long run. Cool, thanks for the insight. One last question… What’s your life motto? Or something that you try and live by? Oh wow, that’s tough. I definitely live with certain things in mind but when I say them it all sounds like a hallmark card. I guess I would say this: Live for experiences, not collections or things. When you put your heart into whatever you’re doing, even if it’s not what you love at the moment, it will eventually lead you to what you love. Whether you’re actively looking for a new role or simply exploring opportunities, Vettery is the best way to find a job you love. We’re passionate believers that finding a new job should be a transparent and exciting process.